This drink. Oooooo, this drink. It inspires me. But the bills I was racking up at Caribou Coffee, where they created this delicious tea latte, were not inspiring. They were downright depressing. How in the world is $3.80 for a small okay? What do they think Caribou Coffee is, an airport?! Don't worry, Caribou, I still love you, and I will still be visiting you. In fact, I just ordered another tea latte yesterday. But for me, this is the Winter of Drink Recipes, or so it seems. 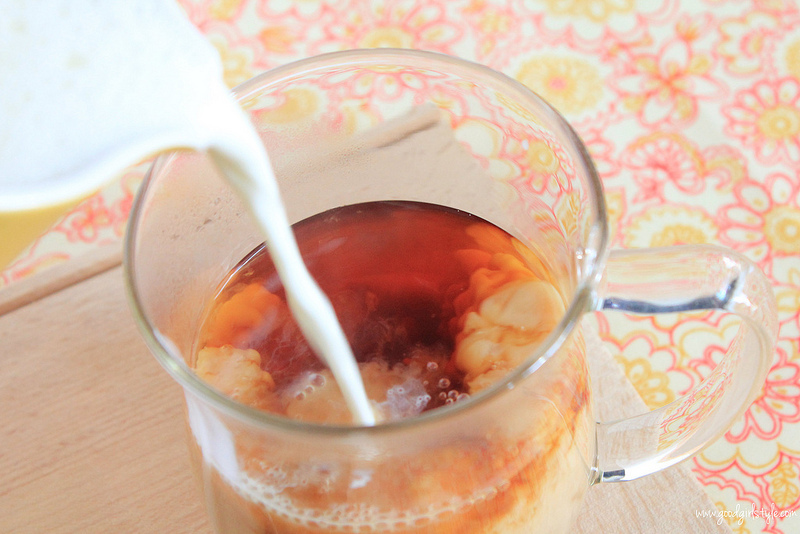 Being able to make lattes at home is fun and easy, too. 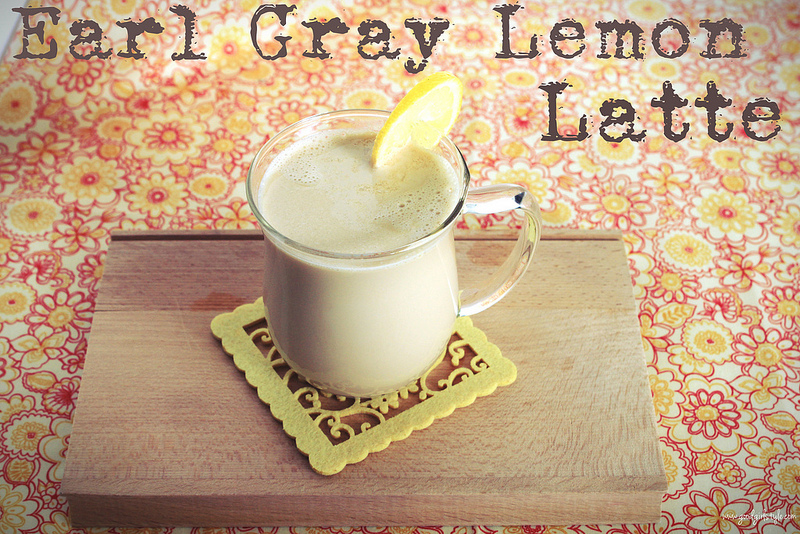 So I pulled out my darling little vintage yellow pitcher and set to work recreating the "earl gray tea extract" and "lemon creme sauce" per Caribou Coffee's website. Go ahead and thank me now. 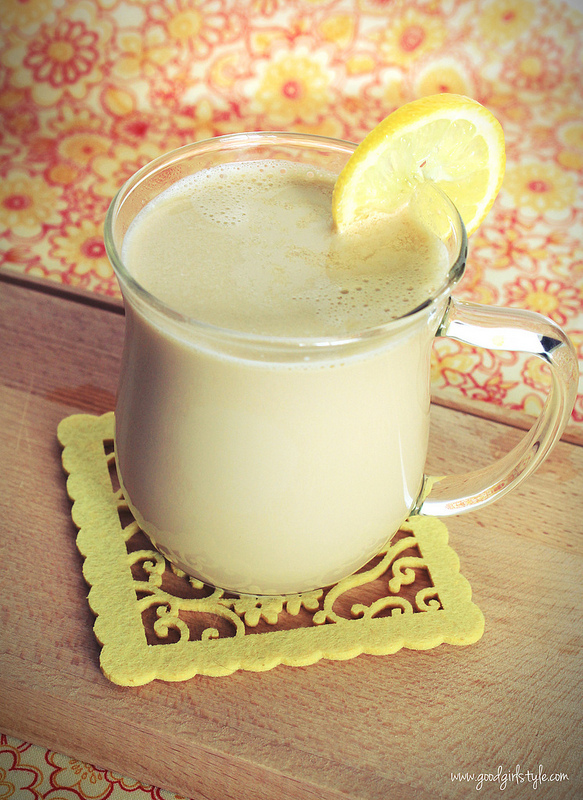 Or come over for an Earl Gray Lemon Latte. I hope I spelled Gray with an "a" this whole way through, because sometimes I get a little excited and throw an "e" in there. Fair warning: Earl Gray tea is caffeinated. Makes approx. 2 regular-size or one giant-sized or one regular-size & one refill...you get the idea. Use twice as much tea as you normally would in half the water. I used 2 teabags in 2/3 of a mug of water, as I usually use a very large mug for my tea. Steep 5 minutes, no longer or else the extract will become bitter. Remove tea bags and keep extract warm. Fill the mug 2/3 full of tea extract, slowly pour in the lemon milk to fill the mug. Enjoy! Yum, I love my chai tea latte, but this sounds delicious! Definitely going to try that! Found your blog via Rags to Stitches, so glad I did! 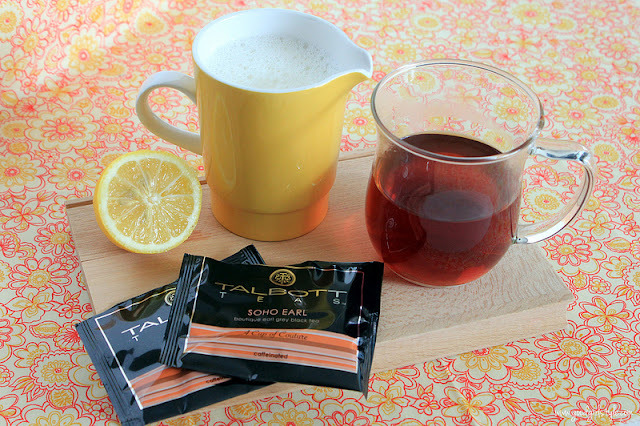 Earl Gray is my new obsession, so I can't wait to try this recipe!! Yum. What a bummer! I think this would work well with soy milk...but I don't pick that up too often! Haha, no prob! "Most perfect afternoon pick-me-up" makes much more sense, but mostest feet is funnnier! LOVE these from Caribou. Thank you for posting this. My boyfriend and I will be making these for Valentine's Day! Hope you enjoyed it, Katie!! Can I use, lemon juice instead of extract? what do you think about it? Hi Maria, Thanks for your question :-) I think the lemon juice would curdle the milk and that wouldn't be good! BUT you can use lemon extract (as opposed to lemon oil called for in the recipe) that is much more readily available at any grocery store. I've heard to double the amount since the extract is not as strong as the oil. I hope that helps! I can't wait to try this. It is my fav from caribou but where I moved caribou doesn't exist! Oh my! I made this and it is fantastic! We don't have a caribou out here in Los Angeles but I can imagine if we did I'd go broke with this latte. Love this!